The #100sareepact has changed me. I’ve become a more confident woman. Don’t get me wrong I’ve always been a self assured woman, but the last few sarees surprised me in the impact they had on my self esteem. I travelled abroad, to Europe, for three weeks, early May, and just returned. 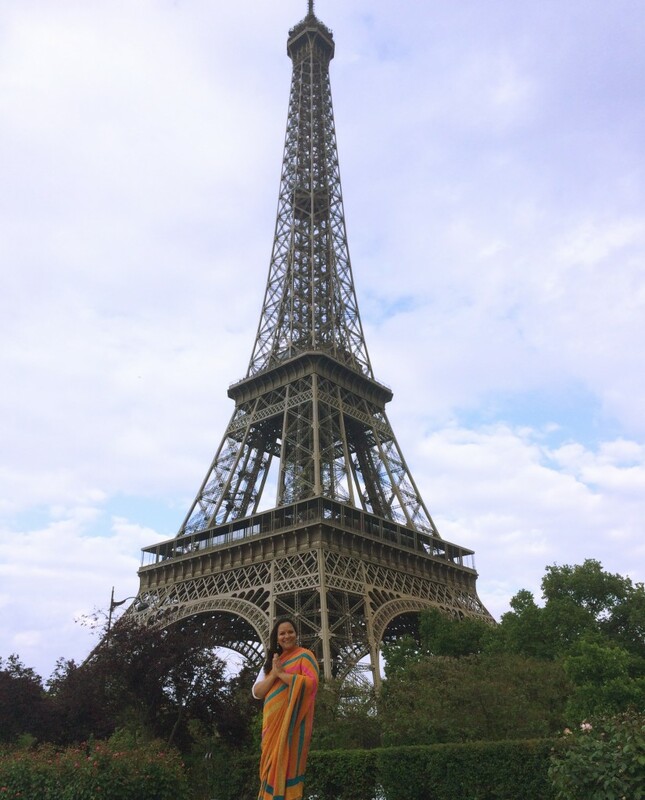 And I wore a saree in each country I visited. Rome in Italy. Zermatt in Switzerland and Paris in France. Let me tell you about the experience. I’ve been abroad before. I’ve even worn sarees while I’ve been there. But to a private lunch or dinner, a party even, where I made a statement in the saree I wore, or on a festival to visit a temple with friends and family. Always within a familiar circle that was tied together in knowing me a little or at least the Indian-ness in me. So what was different this time ? This time, because of the #100sareepact, and staying true to the spirit of the pact, I wore the saree as an everyday occurrence. In the middle of a street as a tram pulled in, in Rome. Then walking to a church and visiting it with people from all faiths and nationalities admiring the art on the windows, the floors & the ceiling, then on a ski slope, and lastly, on the bank of the river, Seine, right next to the Eiffel Tower. Usually, I would be in my jeans, tees, jackets, scarf and sneakers, as a tourist in a foreign country. The ubiquitous “uniform” of everyone who goes to discover new lands. I mean, woe be on the salwar clad aunt or saree clad relative who would stick out like a sore thumb, right ? That wouldn’t do. If it is a western country, more often than not, we all try and blend in. Be the same as others. We Indians talk louder than most, but in a foreign land, even that we remember to change about ourselves. Hushed tones, caps on head. “ Excuse me, pardon, thank you” are phrases we remember to use. Just another brick in the wall. Still a different coloured brick, but…no matter your status, on the road in a foreign country you just prefer to be invisible. It never sat easy, for most of us, but again most of us and people like us, have taken it upon ourselves to wash, through our stellar, civil & westernised behaviour, all the sins of our loud compatriots who just don’t know how to behave in a foreign land. Yes ? Well, this time, on three counts, I refused to fit in. Every time I wore my saree, I proudly walked with my head held high, meeting the eyes of strangers as they looked at me. Remember saree wearing has, till now, not been my usual habit. This time I stood out. I chose to. I felt confident enough to do so. You know that feeling that you get at the nape of your neck when someone makes you feel like you don’t belong. Or says something that is cutting or hurtful. Self doubt and low self esteem are a killer combination for confidence boosting. Every trip abroad, I’ve had my brushes with meanness just like many of you. The slight derision in the tone of a waiter, or that lady at the checkout who gives you the once over. Or the fellow traveller who grumbles under his breath as you try and figure out the ticket machines for the metro in every new country. They say the world mirrors your attitude. Well, sometimes it does and sometimes it just won’t. I was just a teeny tiny bit hesitant about wearing the saree in such a public manner. Only for the fact that I did not want anything to go wrong. I react to bad attitude. Saree or not. Also, I didn’t want anything anyone said, or did, to mar my memory of being in a saree in a foreign land. Youngsters can be cruel as they shout out expletives at anyone they think doesn’t fit in. Your own teenagers can be disapproving of your actions in a foreign land. And I was venturing into crowded streets in Rome and Paris. 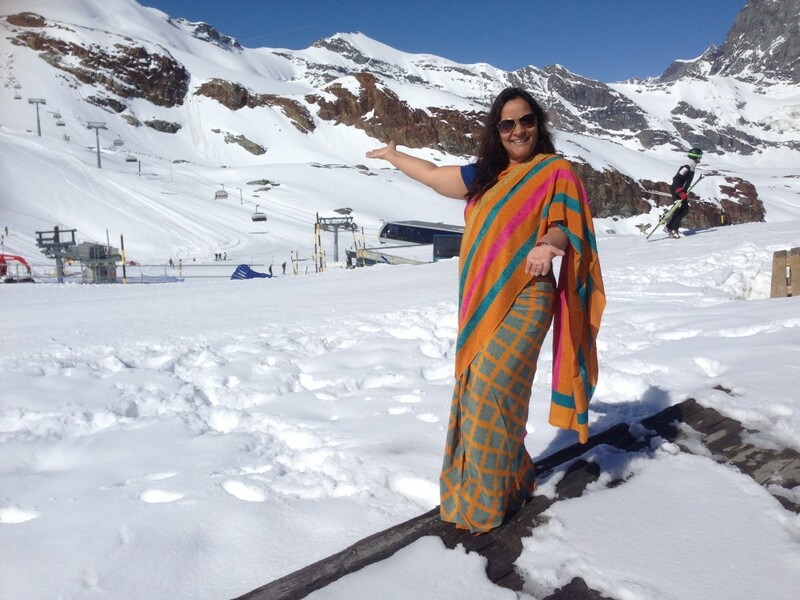 In Zermatt, I was clearly out of place, in my saree, on slopes where people, including my kids, were in ski gear and snow boots. So this is how the #100sareepact changed me. 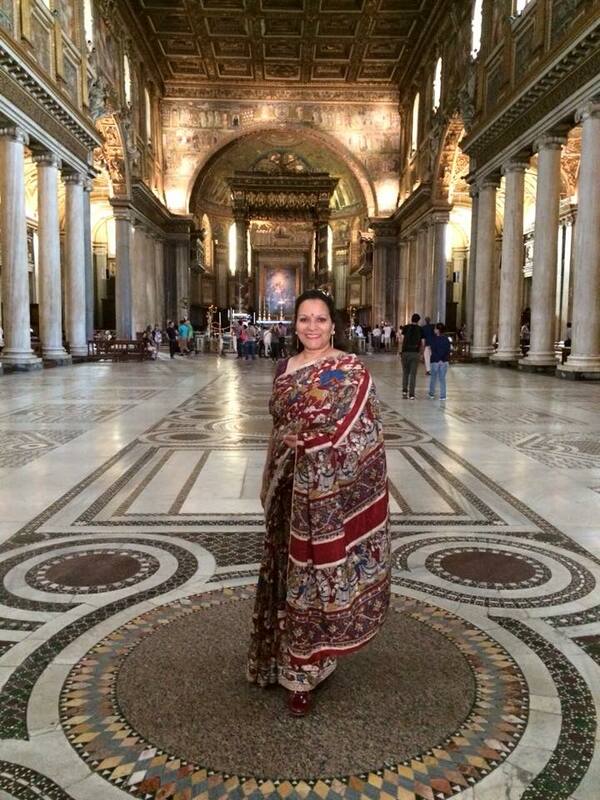 It made me confident in my skin to walk amongst crowds of all nationalities in my saree. To pose in the middle of a crowded boulevard and smile at the camera. To stand in the path of a tram, in the centre of a church, even on top of a bench and pose a namaste so as to get the tall Eiffel Tower in frame. I was asking for attention and I got it. In the manner of praise and appreciation that came my way. A Nun at the Basilica Papale di Santa Maria Maggiore, raised her eyebrows and smiled at me as I posed. The priest who was ushering every one out at closing time, waited patiently while Ketav took a shot of me standing alone in the church. A tram slowed down while I stood on the tracks. A skier jumped up six feet in the air, in a show of stunt, to photobomb our shot. We didn’t manage to capture that moment. Two more stopped to ask if I was cold. At the Eiffel Tower, a lady returning from work yelled “Pretty” at me and smiled when our eyes met. Another couple stopped and said it was lovely to see a woman in a saree on the bridge. The saree that would have made me an oddity otherwise, in the circumstances, has now empowered me to be confident. It was empowering, standing there in a saree. On the surface, just a woman posing for her husband’s camera in naive attire. But deep inside, I felt like I was staking claim to my place in the sun. I counted. I mattered. I was no longer shy to be noticed. It was fine for people to stare if they wished. It was alright for them to wait a bit for the camera to get the shot and I did’t have to over compensate with apologies for their wait. We would smile at each other. They acknowledged my presence.The very garment that made me stand out also made me feel equal. This was interesting for me. My reaction to what I did and everyone else’s reaction to me. And my most endearing moments ? My kids stood proudly by my side, as did my husband, as I posed in my sarees. Their cheering me on, mattered most. Just like so many around the world, I boldly embrace my Indianness. Modern is a state of mind. Not a style of dressing. The saree, in all it’s glory, is the most path breaking when teamed with a positive outlook. The #100sareepact and it’s magic. It’s everywhere, in every wear of a saree.